President Andrew Jackson: Short biography of President Andrew Jackson and the key events during his presidency. Andrew Jackson (1767-1845), nicknamed the "Old Hickory", was the 7th American President and served in office from 1829-1837. The Presidency of Andrew Jackson spanned the period in United States history that encompasses the events of the Jacksonian Era. President Andrew Jackson represented the Democratic political party which influenced the domestic and foreign policies of his presidency. Andrew Jackson went against political convention and chose his friends as advisors rather than use the cabinet, they were referred to as the "Kitchen Cabinet" which caused resentment during the Peggy Eaton Affair as did the use of the "Spoils System", that gave jobs for the boys. The major events that occurred during the time that Andrew Jackson was president included the opening of the Oregon Trail (1830), the Indian Removal Act (1830), Second Seminole War (1835), the Bank Wars, the Nullification Crisis, the Battle of the Alamo and the Texas Revolution (1835). The Abolitionist Movement was growing in the period that saw Nat Turner's Rebellion, the Fugitive Slave Act and the emergence of the "Underground Railroad". Andrew Jackson died of tuberculosis on June 8, 1845, aged 78. The next president was Martin Van Buren. The nickname of President Andrew Jackson provides an insight into how the man was viewed by the American public during his presidency. The meaning of the Andrew Jackson nickname "Old Hickory" refers to Battle of New Orleans (January 8, 1815), the War of 1812, when Major General Andrew Jackson defeated the British. Andrew Jackson was greatly admired by his troops who affectionately referred to him as being as "tough as old hickory." The character traits of President Andrew Jackson can be described as open, frank, charismatic and charming with excellent leadership skills. It has been speculated that the Myers-Briggs personality type for Andrew Jackson is an ESTP (introversion, intuition, thinking, perceiving). An outgoing, active, influential and resourceful character with the ability to improvise to achieve desired results. 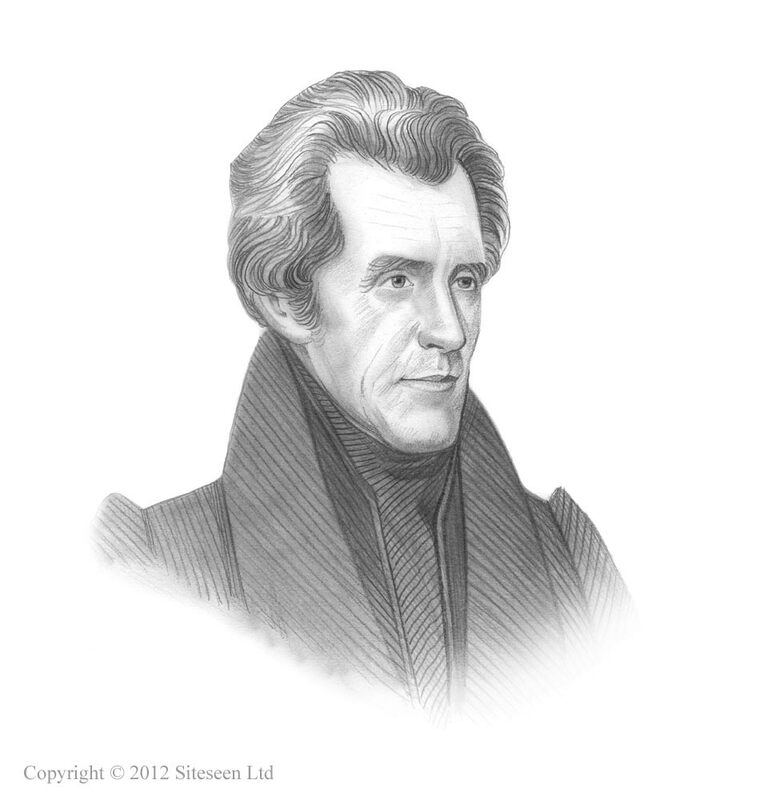 Andrew Jackson Personality type: Socially sophisticated, persuasive, competitive and easily bored. The accomplishments of Andrew Jackson and the most famous events during his presidency are provided in an interesting, short summary format detailed below. Summary of the 1830 Indian Removal Act: The 1830 Indian Removal Act was signed by Andrew Jackson and was the start of the forced removal of Native American Indians fro their homelands. Summary of Nat Turner's Rebellion: Nat Turner's Rebellion was a short lived slave revolt that started on August 21, 1831 and was quashed within 48 hours during the presidency of Andrew Jackson. The bloody rebellion was led by religious leader Nat Turner and 60 slaves Nat Turner's rebellion raised southern fears of a general slave uprising. Summary of the Abolitionist Movement: The Andrew Jackson presidency saw the emergence of the Abolitionist Movement in 1831. The abolitionist movement was based in the North and its goals were to bring about the emancipation of slaves in the agricultural slave states of the south that depended on slave labor for their cash crop economy. Summary of the Underground Railroad: The Underground Railroad, a secret organization, supported by Abolitionists, was established in 1831 to help slaves escape from slavery in the Southern slave states to freedom in the Northern free states and Canada. Summary of the Tariff of 1832: The Tariff of 1832 was a Protective tariff that was passed to ease the conflict between the North and South states created by the 1828 tax referred to by its critics as the Tariff of Abominations. Summary of the 1833 Force Bill: The Force Bill authorized Andrew Jackson to use military force against any state that resisted the protective tariff laws It was in response to the actions of the South Carolina legislature who had declared the Tariffs of 1828 and 1832 null and void. Summary of the Nullification Crisis: The Nullification Crisis was sparked by the South Carolina Exposition resulting in the Southern states opposing protective tariffs which damaged the economy of the South. Summary of the 1833 Compromise Tariff: The 1833 Compromise Tariff was signed by Andrew Jackson to defuse the gravity of the Nullification Crisis. Summary of the Bank War: The 1832 events of the Bank War were initiated by Andrew Jackson to bring about the destruction of the Second Bank of the United States and transfer government money into selected state banks. The Bank War led to the emergence of the Pet Banks favored by Andrew Jackson and the Wildcat Banks in the west (Pet Banks and Wildcat Banks). The Specie Circular was the name given to an Executive Order issued by Andrew Jackson aimed at curtailing the Wildcat Banks stipulating that all government owned lands must be paid for exclusively in gold or silver (specie) in order to restrain excessive land speculation in the west and the massive growth of paper money in circulation. Summary of the Battle of the Alamo: The Battle of the Alamo (February 23, 1836 – March 6, 1836) was a 13 day siege fought at a mission in San Antonio between Mexican forces of about 4000, led by President General Santa Anna, against 180 American rebels fighting for Texan independence from Mexico. The Battle of the Alamo was won by the Mexicans but the 13 days gave General Sam Houston time to build his Texan Army to fight in the Texas Revolution. Summary of the Texas Revolution: The Texas Revolution (October 2, 1835 - April 21, 1836) was fought during the presidency of Andrew Jackson between the government of Mexico, led by General Santa Anna, and Texas colonists. General Santa Anna was captured, the peace treaty of Velasco was signed and the defeated Mexican army, crossed the Rio Grande back into Mexico. The Texas Revolution resulted in the establishment of the Republic of Texas. Summary of the Gag Rule: The infamous Gag Rule was applied in Congress from 1836 to 1844, banning petitions calling for the Abolition of Slavery. Summary of the Cyrus McCormick reaper: The Cyrus McCormick reaper was invented in 1831, during the presidency of Andrew Jackson. The mechanical horse-drawn reaping machine would revolutionize farming methods but did not come into general use until 1845.